The KOKS CycloVac air displacement system with cyclone separator is designed for heavy industrial applications. Suitable for suctioning, displacing (option), transporting and unloading of dry, wet and hazardous substances, e.g. (roof) gravel, powders, fly ash and sludge. Various option kits available to suit the industrial application. Specially developed for working with hazardous and contaminated substances. Available in PED, ASME, ADR (Ceoc), DG and/or ATEX (Ex) (pump system) versions and built in accordance with all applicable safety standards. The powerful Roots blower gives the KOKS CycloVac air displacement system a very high suction and displacement capacity, which makes it possible to process and transport large quantities of dry substances, liquids, gravel, sand, etc. in a very short time. The user benefits from significant time savings and a huge reduction in cost. 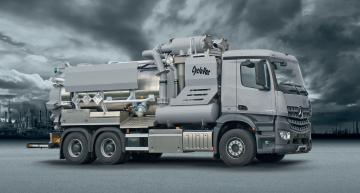 3-axle chassis with a minimum engine power output of 400 hp. Suctioning, displacing (option), transporting and unloading dry, wet and hazardous substances, such as sludge, sand, (roof ) gravel, fl y ash, powders and various types of liquids. PED (Pressure Equipment Directive) in accordance with EN 97/23/EC standards. Volume : 12 m³, excl. cyclone separator. Material : stainless steel AISI 316 grade; material no. 1.4404. Rear door : hydraulically opening and locking. Emptying : by means of tipping (45°) or air displacement. Loading : by means of suctioning or through the manhole on top. •	6” suction connection, incl. coupling as desired, provided with 8” elbow with exchangeable Hardox wear resistant plate. •	6” discharge connection, incl. coupling as desired, on the rear door (excluding quick-release system). Design : 2x 4 cyclones for separation of material particles with a separation degree at materials with a specific gravity of 580 kg/m³ = 97,3%, with 1,3 μm size of mesh. Provisions : separator tank, provided with a vacuum return system in combination with the air cleaning system (air shock system/air return current) on behalf of cleaning the cyclones and filter elements. •	cyclone/filter cleaning by means of a programmed 3 phase pulse time interval switch, adjustable on the control panel. •	level detector (wet/dry) in the collecting receptacle. •	labyrinth plates in the pressure/vacuum tank. •	fine dust safety filter. Air displacement : 8,100 m³/h (220 kW). Max. overpressure : 1,050 mbar. Drive : by means of a crank shaft and V-belt transmission from the fly wheel PTO. Length : approx. 9,400 mm. Width : approx. 2,500 mm. Height : approx. 3,950 mm, chassis-dependent. Wheelbase : approx. 4,500 mm (axle 1 - axle 2) + 1,400 mm, chassis-dependent. Weight empty : approx. 17.6 ton, chassis and version dependent. Max. technical permittible weight : approx. 33 ton (combined with a 33 ton 6x4 chassis).